Few and far between are the English majors asked to write for their university’s entrepreneurship center, which is surprising given that storytelling lies at the very heart of business innovation. This year’s Creativity Challenge asked the participating teams to do just that: to decide on the story we wanted to tell about our 21st-century society. Having decided that we would participate in the challenge, Falvey Communication and Marketing Department Team Leader Joanne Quinn came to one of our bi-weekly meetings to pose this very question to the team. 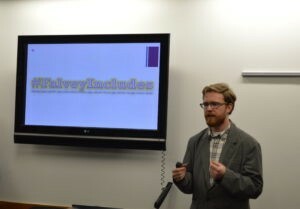 The initial idea proposed by the team, the creation of an inclusivity bibliography to be distributed on a bookmark, appropriately marketed the library community but did not fully address the question posed by the ICE. First and foremost, the creation of a bookmark implied an understanding of diversity and inclusion that was simply too static. As 21st-century communities, philosophies and politics develop and change, the bookmark would remain the same and thus would run the risk of becoming out-of-date or obsolete. Now I must confess to you that we often discuss diversity and inclusion in the world of graduate English studies, but we rarely have the opportunity to propose practical solutions. Given a particular frustration with this fact, and the encouragement of Joanne, I took on the role of project lead. As project lead, I noticed the glaring need to address the Creativity Challenge more comprehensively (i.e., how does a bookmark really create a community?) and the need to develop a dynamic response, capable of changing with the times. 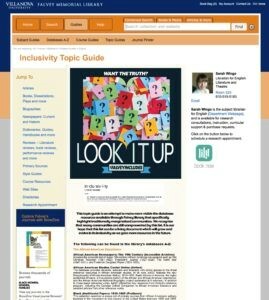 I proposed to the team the creation of an Inclusivity Topic Guide. While the team agreed to the central premise, I learned a great deal about my team’s individual talents and the pressures of being a project lead through their feedback. I discovered that the topic guide, while forming a strong foundation for our pitch, was incomplete in many ways. As I pitched it initially, the guide would have addressed such issues as misinformation and fake news, which I still believe are mostly at the expense of marginalized voices. Subject Librarian and Team Liaison Sarah Wingo suggested, however, that we reconsider the objectives of the guide. Sarah correctly pointed out to me that “this guide isn’t teaching students about how to assess resources to determine when something is ‘true;’ it is providing and promoting resources on marginalized communities.” We witnessed, then, our project develop from too simple to far too ambitious. Another problem existed as well. My concept for the topic guide included a community-driven section, meaning a sort of cyber safe-space for those who visit the page to develop or share their own content. I proposed that a few of the subject librarians moderate this space. Both Sarah and Joanne posed some complications surrounding this word “moderate.” If the moderators decide what goes on the page, doesn’t that erode at the page’s own main objective? We settled on the idea that a few staff members must monitor rather than moderate the page to keep in the spirit of a physical campus safe space, where conversation is monitored not moderated as well. Once the team worked out these objectives and practicalities, our focus shifted to concretizing the idea and developing a marketing and promotional campaign around it. In addition to a webpage mockup and a sample laptop sticker to promote the page, the team also came up with the idea for a launch party. I believe there is still mixed sentiment among my team members about the effectiveness of the slogan. In this mixed sentiment, however, I learned another important lesson about taking the lead on a project: take criticism from team members and adjust accordingly; when your creative impulse, though, feels strongly about a particular element – the slogan for example – stand up for what your instinct tells you. “Look it up!” and the attached graphic are among my favorite outcomes of this challenge. 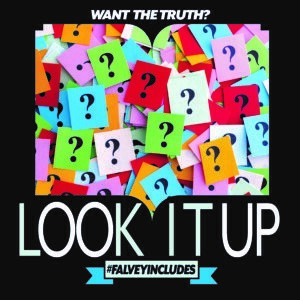 Within the graphic, you’ll see the hashtag #FalveyIncludes. The proposed page will display social media posts that use this hashtag, and its simple noun-predicate construction will remind users of the page as an ongoing project. The laptop sticker and the hashtag left out one potential aspect of promoting the page: an actual gathering. The members of the Falvey Communication and Marketing Dept. 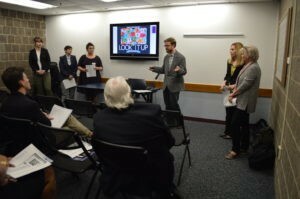 who focus most of their energies on events – Gina Duffy, Kallie Stahl, and Hunter Houtzer – pointed out that a launch party could draw visitors to the library and serve as the foundation for creating the cyber community via the webpage. Gina pointed out that our proposed timeline with the page would correspond closely with the Center for Access Success and Achievement’s move into the Falvey. Thus the idea of a launch party was married with the idea of a welcoming party, and this particular promotion became an essential part of the pitch. By the time pitch day rolled around, we had grappled with and ironed out all these ideas into a structure that we believed hit all the criteria for a Pitch Day award. Joanne gave a succinct introduction, and then I spoke for the body of the pitch. The rest of the team filled in the gaps we left with a lengthy Q&A. In the end, we finished among the top teams in the challenge, with the judges remarking on how well we met all the criteria for an effective pitch. The prize money has gone toward starting to develop this page, and, while I’ll be away for a majority of the summer, I’m excited to see how the project continues in the fall. What strikes me the most in looking back is exactly what attracted me to participating in the challenge in the first place: the story. As a first year graduate student, I was genuinely pleased to go from bookmark to launch party as a member of this team. Reprinted with permission from the ICE [Innovation, Creativity and Entrepreneurship] blog. William Repetto is a graduate assistant with the Communication and Marketing Dept.